- The merger of local authorities allows the regional council functions to be merged, similar to the couple of unitary authorities we have now. The split of functions doesn't really make sense, complicates the governance questions and leads to intra-local authority in-fighting. 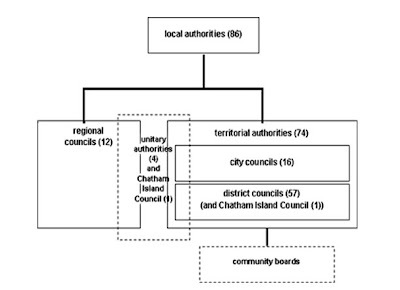 - Few local authorities, defined more around contemporary communities of interest. Eg, Greater Wellington, Taranaki, etc. Someone once suggested to me the present DHB boundaries would make some sense. - Bigger local authorities. This would allow the administration to harmonise and consolidate their work. No need to re-invent the wheel on the regulation of prostitution across the Auckland region. Or for different frameworks for regulation of the RMA. - But bigger local authorities need smaller access points for public participation. Community boards are presently optional but I think any move to merge local authorities requires compulsory and universal community boards. 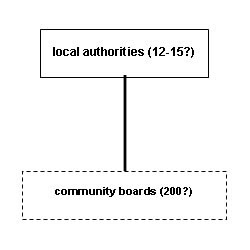 That is, each local authority district must have community boards covering the entire district. Here, we can insist on smaller communities of interest. Eg, in a Greater Auckland model (say) Papakura District would be represented by the Papakura Community Boards. The former Wellington City within Greater Wellington might be split into two or three, ie Southern, Central, and Northern Wellington. And most significantly, these Boards would need to have automatic responsibilities (presently their role depends on the authority and funding given to them by their parent local authority). I suggest they have standing delegations to hear "local" resource consents and a budget for "local" projects; other matters would continue to be dealt with at the local authority level. This allows the local community to make decisions about local matters such as town centre development, local parks, local developments, but ensures that matters with broader implications or needing greater strategic expertise (regional planning or infrastructure) is done at a higher level. Now none of this is specific to Auckland - but it might be that the examination of these issues in Auckland could trigger some reflection on these issues across the country. Having separate Capital & Coast and Hutt DHBs never made much sense to me. And you'd probably still want a separate Chatham one etc. But the idea makes some sense - just don't have them elected "at large" DHB-style. These are very close to the original Provincial Councils with Auckland divided into four regions. The Provincial Councils were subdivided into municipal councils and district roads boards. So what you are proposing is a re-establishment of the original form of government introduced by the Constitution Act but with a recognition of the physical merger of most of the original boroughs. It seems that within a quarter of a century of Parliament replacing this simple structure with hundreds of tiny counties they had become feifdoms that fought tooth and nail against being merged. From the 1920s to the 1950s the Main Highways Board was able to get co-ordination on road works by establishing 20 District Highways Boards. From 1954 these Highways Boards became Regional Planning Authorities but unfortunaely the only part of their planning that had any real meaning was improvements to State Highways as these were under the control of the MHB's successor, the National Roads Board. Both of these boards were statutorily independent of both central and local government so they were never mired down in petty politics, which meant they actually got things done. Of course, the fact that they could decide where motorways would be built but could not dictate sensible land zoning to get the best out of these motorways meant most of the congestion reducing benefits that could have followed from motorway construction have simply not occured.